Scarlets claimed their first Champions Cup win of the season by edging out 14-man Benetton at Parc y Scarlets. Paul Asquith scored two minutes from time to cap the Welsh side's fightback. Benetton had seemed set for a famous win despite Francesco Minto being sent off for a tip tackle after 23 minutes. Gareth Davies crossed twice for Scarlets within five minutes but that sparked a Benetton reply with Robert Barbieri, Jayden Hayward, Angelo Esposito and Federico Ruzza scoring. Scarlets led 21-14 at half-time thanks to Tadhg Beirne's try, but needed a Steff Evans score five minutes from the end to get back on level terms with Benetton before Asquith's late winner. Benetton at least had the consolation of two bonus points, while Scarlets' five-point haul puts them back into contention in Pool 5. Leaders Toulon strengthened their grip by beating second-placed Bath after Scarlets' victory. The home side recalled 10 internationals as European competition returned, and that number included Davies, who was back after sitting out Wales' win over South Africa with a minor injury. The scrum-half made an immediate impact as he scooted through untouched as Benetton were caught napping from a Scarlets line-out. Davies crossed again three minutes later, taking a pass from James Davies to round off a flowing Scarlets move. 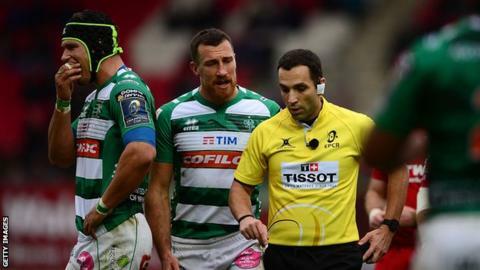 Leigh Halfpenny converted both for a 14-0 lead, but Benetton shrugged off their slow start as Barbieri picked up from the base of a scrum to bash over. The Italians then had Minto sent off by referee Mathieu Raynal for upending lock David Bulbring in the tackle. Scarlets kicked for the corner from the resulting penalty and Beirne went over from the attacking line-out, Halfpenny again converting. Again Benetton found a reply though, when Tommaso Benvenuti broke through the midfield, culminating in Hayward going over. Tommaso Allan added his second conversion to trim Scarlets' lead to 21-14 at half-time. The Italians continued to make light of their man disadvantage after the restart and Alberto Sgarbi was held up over the line by some desperate home defence. Benetton continued to press and levelled the scores when Esposito stepped inside rival wing Evans and held off Gareth Davies for a converted try. Scarlets flanker James Davies was sin-binned for slowing the ball and Benetton took advantage as Ruzza went over from close range to claim the lead for the first time - and guarantee a bonus point. In a breathless last five minutes Evans showed his finishing prowess to cut inside the Benetton defence, with Rhys Patchell converting to level the scores. Wing Evans then chipped through to gather and send Scarlets pouring forward, with another accurate grubber sitting up nicely for Asquith to seal a last-gasp win and keep alive Scarlets' Champions Cup quarter-final hopes. Scarlets coach Wayne Pivac told BBC Radio Wales: "It was the full range of emotions... down to the last minute. "We started really, really well - just how we wanted to - then the red card came and psychologically we just expected it to happen really. "We talked about that at half-time and defensively we were just soaking up and they were getting a roll-on the whole time; our normal game of chopping, getting over the ball and turning things over was non-existent. "But the energy we showed in the last four-and-a-half minutes and the first eight minutes was enough to win us the game." Scarlets: Leigh Halfpenny; Johnny McNicholl, Paul Asquith, Hadleigh Parkes, Steff Evans; Rhys Patchell, Gareth Davies; Wyn Jones, Ken Owens (capt), Werner Kruger, Steven Cummins, David Bulbring, Tadhg Beirne, James Davies, John Barclay. Replacements: Taylor Davies, Rob Evans, Simon Gardiner, Lewis Rawlins, Josh Macleod, Aled Davies, Steff Hughes, Tom Prydie. Benetton Rugby: Jayden Hayward; Angelo Esposito, Tommaso Benvenuti, Alberto Sgarbi (capt), Monty Ioane; Tommaso Allan, Giorgio Bronzini; Nicola Quaglio, Hame Faiva, Tiziano Pasquali, Marco Lazzaroni, Federico Ruzza, Francesco Minto, Sebastian Negri, Robert Barbieri. Replacements: Luca Bigi, Federico Zani, Alberto De Marchi, Marco Fuser, Whetu Douglas, Tito Tebaldi, Ian McKinley, Luca Morisi.